Cooper loves smoothies, but this one was for both of us. I wanted to start adding vegetables into his smoothies, to up the nutrients. I decided to start with spinach. I made this smoothie and added yoghurt and milk. I always have a tub of Total Greek Yoghurt in the fridge for Cooper and last minute desserts and they do a 0% fat version, if you are watching your weight. I don't think you can get a better yoghurt. I am rather addicted to it. I am going to try this smoothie as a pure juice drink next time. I don't know why I didn't pour myself some to try before adding the yoghurt and milk, but it is possible that Cooper may well have been urging me to hurry up at this point. 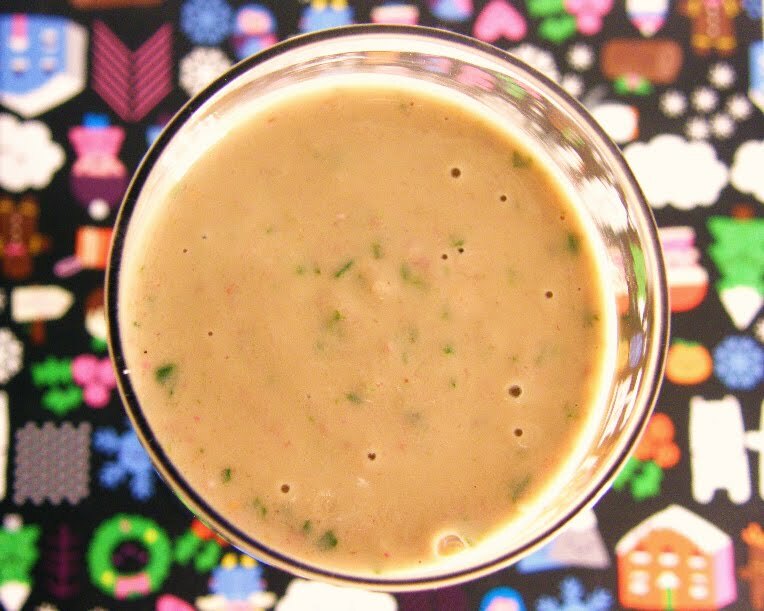 This smoothie is a sludgy colour, but don't let that put you off, it is very tasty and so good for you. A great way to start the day. A sludgy coloured smoothie. Packed with nutrients and flavour. The secret ingredient is spinach, but you don't taste it among the other flavours. A sneaky good-for-you drink, tested and approved by my two year old. 1. Squeeze enough oranges to a cup with juice.2. Wilt the spinach. I like to pop the spinach in a colander and pour over a kettle full of boiling water, then pour cold water over the spinach to refresh it, then squeeze out the excess water before drying on a clean tea towel.3. Add the orange juice, spinach, raspberries and banana to a food processor and whizz until smooth.4. Add the milk and yoghurt and whizz until combined.5. Strain the smoothie through a sieve to catch any large pieces of spinach.6. Enjoy. I am submitting my smoothie to a new foodie challenge from Ren over at Fabulicious Food. 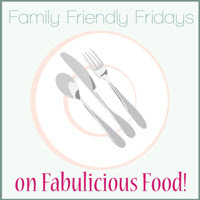 Ren came up with the idea for a weekly event called Family Friendly Fridays, to highlight family mealtimes. Hi Johanna, Cooper is quite limited in the range of fruit he likes, but he is always happy to glug them down as a smoothie, so I can't complain. I love smoothies and would never have thought to add veg! I do add grains and fruit to make it healthier. can you taste the spinach? Not really Ros, it is mostly the fruit, but you know there is something else in it. I think it would be hard to pinpoint though. This Sylvia loves smoothies and this one looks great! I had one not too long ago that had apple and cucumber in it, which was also delicious. I love smoothies & this one is a great one! Wonderful - printing this out now!